Some housekeeping before you read today. I’ve finally launched my own website, patchus.co.uk; and the blog address will now be blog.patchus.co.uk. Visit both, and let me know what you thoughts. For the record, I love dogs. I love dogs a lot, and act like Christmas has arrived when I see a dog on my side of the street. Two of my best friends just got a French bulldog, and I’ve already sent that thing two care packages (they have only owned her since October). Of course people always say ‘Oh just get a dog, why don’t you have a dog?”, my answer is simple “I’m not ready for that kind of commitment”, which is true. Getting home by six to let the dog out seems like a novel concept to me. But since I can’t have a dog, I find other ways to satisfy my dog needs. Sometimes I’ll walk by dog parks just to see what is going on over there, with the subtle hope one breaks lose and I have to return it. Upon the return I start chatting up the owner who lets me into the inner dog circles (obviously sans dog, but come on people details details). There are some dog parks that wont even let you in without a dog (understandably). I also have a general rule that I wont do a presentation unless I can sneak in a dog into my presentation, but to be fair that has become my niche. I was all ok with this until recently; a co-worker sent me an instagram dog account to follow, and then it hit me, am I following too many dog accounts? Enter exhibit A, the graph of instagram to dog instagram ratios. The red line, titled ‘Full Blown Crazy’, really should be titled ‘Do you understand instagram’. Like clearly there are other instagram accounts, and if you only follow dog accounts, you clearly do not understand instagram. I mean, there is more variety like : Coffee, Cats, reposts from reddit and pictures of people eating food. The next level is ‘pretty crazy’ think of this as the cat lady style instagraming. If your feed is full of dog accounts, you need to spice things up, you clearly have too many dogs in your life. If there are ten pictures in your feed, more than two of them should not be dogs. Kinda Crazy was dangerous range. If you get carried away, and just start following all the dog friends of your dog accounts you will easily slip into this range, guys (and gals) don’t do this. A rule I like to follow, choose your dog accounts wisely, because there is such a thing as too many. Normal is considered three accounts for every ten, seems pretty normal to me. The final category is just as important. A person who follows NO dog accounts is one of two people. He/She is either a cat person, and we all know how cat people are, or he/she is probably a serial killer (do note, not mutually exclusive). I mean who seriously does not like dogs, and does not like the occasional picture of a dog. I think my new friending feature will be the dog check, is this person following at least one dog account? If yes, you may proceed, if no, please try again. If you ever visit NYC, there is a little hidden surprise when you take the six train. A passenger can remain on the train as it turns around in order to view a stop that has not been in operation since 1954. The old ‘City Hall’ stop is a huge hit amongst tourists, but here is the problem: the turnaround is debatably legal. Despite many signs, blog posts, news reports and people telling me that it is legal, a friend and I recently received tickets for making this journey. The tickets were $50 each, and I was really upset because it is in fact not illegal to take this journey. I fought the case in the Transit Adjudication Bureau (TAB) court and you guessed it, I lost! This post isn’t about whether riding the six train around the turnaround is legal or not (since we know it is legal), but whether the cost of fighting a ticket is worth your time and money. Let’s assume you, like me, think you are going to win this ticket. You are so sure, that the probability of winning the ticket is I P(Winning) = 1. Winning in this case means you do not have to pay the ticket, so your total fine cost = 0. However, you do have to sit in the misery (and boy do I mean misery), of the TAB offices for three hours while you dispute your case. Loss = 0 + 3*[Hourly Rate]. If you wanted your loss to be less than the cost of your ticket, you could solve the equation and your hourly rate would need to be less that $16 just to fight the ticket knowing you are going to win. But what if you don’t, then how much would need to make? 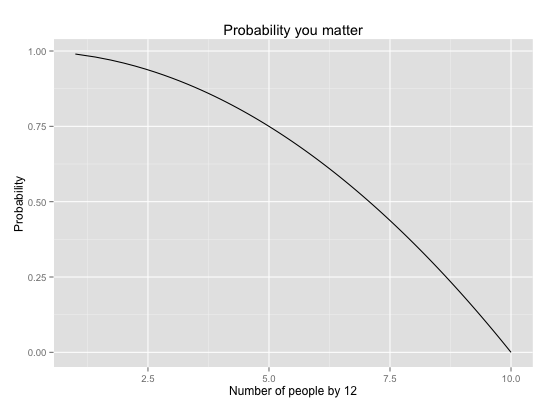 How to read this graph: it is only beneficial if your salary is below that black line at that probability. 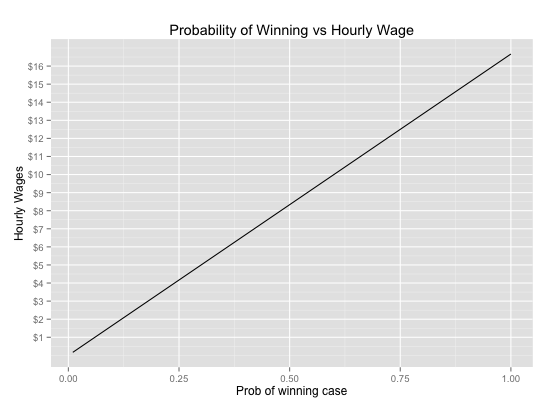 So if you are 75% sure you are going to win the case, your hourly rate would need to be less than $12. If you are say 50% sure and make minimum wage, it is not worth your time. Of course, I’m assuming you would be working from 9-3 (the only hours of operation for TAB), and that you are using your Paid Time Off as a factor. In a strictly cost-benefit analysis, the cost of fighting a ticket is rarely worth it. So if you are a rational human being, just pay the ticket and move on. But if you want to prove a point to the system (like I did), then go ahead and fight it. Right? When I fought the ticket I knew I was going to ‘lose’ money (as in time), but what is the cost of Justice and knowing that the court system got it right? I mean sure, the colonists threw a lot of tea in the ocean that day, but that tea represented the price of freedom and democracy, and that really does not have a price. The sad part is, the TAB court system was not accepting of these ‘point-makers’ or freedom fighters. The room holds about 250 people, and it was packed. It gave me the sense that the judges do not really care about the cases: they are simply doing their jobs. They are only safety nets so that you don’t sue the TAB for being unconstitutional. They have this system in place because they have to, not because they are trying to change the world. Sadly, when you fight a ticket, you are just one person in a sea of humans. The time within the office is very formal. Though you are attempting to fight your case as an injustice, you are treated as if you are begging them to not fine you. The MTA almost surely has a cost benefit to this: what is the amount of tickets they can issue before the government gets involved? If the MTA keeps their ticket processing capacity the same, but issues more tickets, it means less people would be willing to wait longer and longer hours at TAB just to fight a $50-$100 ticket. The processing time per judge would likely remain the same, but if the number of tickets issued increases, so do the hours of wait time. The graph above is based off my single sample of 3 hours, but what if that time went up to 4 hours? That would mean even if I was 100% sure I would win, it would only be worth my time if I made less than $12.50 per hour. So the MTA should increase the number of tickets they issue, thus increasing the hours to wait at TAB, and then decreasing the probability someone will fight a ticket. This is a fine line though, because if the MTA sets the ticket-issuing number too high, the government (hopefully) would come in and regulate the system by enforcing a swifter trial or by making the ticketing rules stricter and thus decreasing the number of tickets issued. If you ever get a ticket, just pay it. Or at the very least, fight the ticket and blog about it. Maybe I actually got something out the ticket (which I’m finally going to pay). I have a story to tell at bars, coffee shops, and most importantly, on my blog. This post is pretty cynical and critical of the MTA, which it naturally should be. I actually don’t mind the subway too much. Sure it smells like pee 90% of the time. It also manages to remain 110 degrees under ground despite it only being 60 degrees outside. Sure there are something like 113 track fires per year, but running the MTA is not easy, so I’ll be kinder next time I take that six train around.